Vasily Petrenko, Chief Conductor of the RLPO, chats with Getintothis’ Rick Leach in an exclusive interview about why classical music matters, the sound of silence and much more. It was a typically drizzly and rather grey evening at the tail end of November as we headed off to the Philharmonic Hall. It had been raining all afternoon and we splashed through puddles in the rush hour traffic. Quite frankly, it was all rather miserable. However, up ahead of us, glowing like a welcoming beacon, was the Philharmonic Hall, home to the Royal Liverpool Philharmonic Orchestra and its Chief Conductor, Vasily Petrenko. For once, weren’t going to the Phil for a concert or a gig, but rather to interview Petrenko himself. And to be honest, it was a bit of a daunting prospect. Vasily Petrenko has been Chief Conductor for the RLPO since 2005 and was the youngest ever appointment in the role, being a mere 29 years old at the time. In the intervening 12 years the RLPO has taken massive leaps forward, and with Petrenko at the helm they recorded a highly acclaimed complete cycle of Shostakovich symphonies – all 15 of them. Concerts regularly sell out at the Phil, they’ve toured successfully in the UK and abroad, including appearances at the BBC Proms. Due largely to Petrenko, they’re considered one of the finest “Russian Orchestras” in the UK at the moment. For live performances he’s embarked on massive cycles of the complete symphonic works of Mahler and Beethoven with the Phil as well as modern classical works; their performance (and UK premiere) of Philip Glass’ 11th Symphony in 2017 being a special highlight. He looks set to stay, having an open-ended contract with the Phil, and while taking on the role as Chief Conductor at the Oslo Philharmonic Orchestra in 2009 as well, there’s a definite sense that his home is the banks of the Mersey rather than that of the Akerselva. In 2016 Petrenko and the RLPO recorded the first of two Tchaikovsky Symphonies sets, winning the esteemed Gramophone Magazine Critic’s Choice award and this year, he personally topped that by being voted Artist of the Year by Gramophone Magazine. And although, classical music itself may have an image of being stuck in the past, ossified and speaking to a select audience (a false perception that he’s keen to refute when we speak with him), more than anyone Petrenko wants to break down those perceived barriers and open the classical music world to a more diverse and younger audience. He’s still only 41 years old and in his third professional role as Chief Conductor of the European Youth Orchestra his ability to connect with young musicians is impressive to say the least and the results of his work in that sphere speak for themselves. So all in all, there’s a lot there. An impressive CV to say the least. And a very interesting life so far, considering he was born in the Soviet Union, benefitted from its rigorous teaching system, witnessed its collapse at the age of 15 and has seen the nostalgic glances backwards to that dark age. Yet now he’s in Liverpool on this rainy evening, having spent all day rehearsing Falstaff and straight off stage without a breather to speak with Getintothis. Although he looks knackered as we meet in his dressing room to chat, he politely refuses a coffee (unlike your writer, who needs as much caffeine as possible) and makes do with a banana. Clearly someone who looks after himself, he’s much, much taller than we imagined and he stretches himself out in his chair, looking like someone who isn’t used to or comfortable with sitting down for too long. It should be pointed out that while Vasily Petrenko is a very serious person and someone who (rightly) takes music very seriously indeed, he is possessed with a dry and ready wit, laughing a lot throughout our interview and always answering our questions very thoughtfully and with good grace and charm. There’s a fierce intelligence within him, tempered with that fervour for music and an ever-present desire to get his points across as clearly as possible – and bearing in mind English is not his native language of course, he makes a pretty good go of it all. So where do we begin? What’s the jumping off point? We take a gulp of our coffee and launch in, both feet first. We start off with a few fairly obvious questions. Why should Getintothis readers listen to classical music? What is there in classical music that you can’t get anywhere else? And is there something special about classical music? What does it actually do? The way that Vasily Petrenko deals with this seems to set the tone. It might be a question that he’s been asked hundreds of times, yet for us and on a wet Tuesday night at the end of November, he weighed his words carefully and thoughtfully, with passion, enthusiasm and at times, a wry humour that shone throughout. He’s also not one for one word answers either or short and inarticulate mumbling. You can tell that music, and the process of making and listening to music is something he’s thought about a lot. Vasily Petrenko: “It makes your life better. In many ways it can satisfy your soul, much more than say, death metal music. It gives you a balance in your life. It’s fascinating; those people who are involved in classical music or those who love classical music well, they are very balanced people. We nod. It’s at this point we realise he’s thought about this a lot. “People who are listening to classical music are some of the most balanced people, mentally. So in a way, I would call it, well, it’s not exactly yoga for your brain but it’s a very nice workout for your brain. And this is the same as if you do a workout for your body. If you do a workout for your body, you are well balanced and you feel well, so classical music is in many ways for wellbeing. He waves his banana in the air as if to emphasise the point. It’s as if he’s conducting with a piece of fruit rather than a baton. “It also – and this is a fact – it also works, especially for young children, incredibly well in terms of discipline. In terms of making them able to focus for longer times and I think this is a very big issue. And I know this-especially looking at my own children! It also, and nowadays, life, where everything is in very short patches. Like in 24-hour news where after 24 hours it’s not news anymore; clips are getting shorter and shorter and where everything is getting based on a 15 second segment. We ask him about how this can be done in a practical sense. How do you get children and young people to listen to and appreciate classical music as opposed to ramming it down their throats? He leans forward in his chair and explains. “For me, well it’s difficult to judge because I’m a professional musician and I listen to music day and night, all the time, but people I talk to say that listening to classical music can help your mental health much more than any other type of music. Classical music can help your metal health and help your brain get much more relaxed than listening to any other music. “Because most of us normally have a very hectic mental activity. It’s a lot of fast thinking and a lot of fast doing and your brain, over the day, over your job, whatever it is, gets tired. As with any physical aspects of the body- of you do a very heavy run, you have to stretch, you cannot just lie down immediately, you still need to do some effort – your body goes…well, you still need to unwind yourself. “And this is the same with your brain. Listening to classical music requires certain thinking. You can relax your brain much more and you can relax your mental thinking much more than with any other sort of music. We wonder why classical music is perceived as “difficult” and hard to get into, when in fact a whole lot of the music we champion on these very pages, is in reality not easy to listen to or understand. Is classical music as difficult to listen to as say, something resolutely experimental or quite niche – say the tougher end of metal? He laughs. To mix a metaphor, we seem to have struck a chord. Vasily Petrenko: “Definitely not as difficult! There’s such a variety in classical music. You’re listening to death metal, you feel the pain of the people who have written it. There’s always another question. Another but… But where do you start? Where on earth can we begin? So we ask him. There’s so much music. It’s vast. 500 years worth. Or more. It’s all a bit…intimidating. Where to begin for someone who wants to well, get into, classical music? Is there a simple entry point or do you dip your toes in the water and see what pops up? Vasily Petrenko: “I think it’s neither one nor the other, neither this nor that. The question is, for yourself, individually, what you want to get from it… emotionally. “If you want, romance for example, listen to Rachmaninov or Tchaikovsky. If you want the feeling of beauty and the feeling of excellence, listen to Mozart. If you want a feeling of storms and turbulence and epic stories, listen to Wagner. If you want a feeling of 20th Century which you can find almost everywhere, listen to Stravinsky. “There’s composers who have written pieces of music for every taste. So, first of all, I think you have to find exactly what you want. “It never works to the point where you say to your neighbours, “I’m listening to classical music” so they’ll respect you a lot more. No! The point to get to get into classical music is what you want to get from it. And that’s for any music really. But for its versatility – classical music! “There’s easy access to it. It’s so easy. For example, go to Spotify, you have enough classical music that would fill the rest of your life for free, rather than pop or rock or other music. It’s like 90 per cent of the music on there is classical. And there’s plenty of options. “First, I would suggest anyway, that before listening to music, I would suggest to people to understand, what do you really want from music? If you want this, then do that. Liverpool. We feel like we have to ask about Liverpool. His home for just over ten years, and somewhat coincidentally, just slightly longer than Getintothis has been going. We’ve kind of reached double figures at around the same time. What makes Liverpool different? 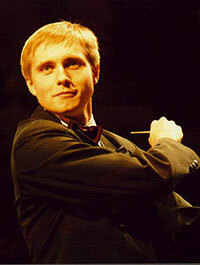 Is there something special about it for Vasily Petrenko? For once, he doesn’t pause. He doesn’t need to think about this one for too long. He grins. Vasily Petrenko: “Live music. Live music! I don’t think that there’s a city of this scale – or even a larger scale – where there’s so much live music played. Every pub, every café, the Philharmonic Hall: everybody playing at home, just for fun. There’s plenty of street players. So, I’ve travelled around the world, probably hundreds of cities and there’s nowhere else in the world like this where you can find it. “Simple creativity, simple love for music from the people, their ability to express themselves and their lack of hesitation which is very, very important. There’s plenty of places across the world where there’s amazing musicians but they’re only confident to play at home. We wonder about difference. Is Liverpool different for him than for us? We suppose that it must be. Maybe the question should be wider. Maybe we should ask about classical music. Maybe this is where the difference is. Is classical music seen differently in Russia than in the UK? “You don’t want to be bothering the person next to you while you’re watching and listening to a performance with talking – you want to hear the performance. “Classical music is not seen as elitist, simply because the Communists never had an “elite” even if they were declaring everyone equal when they clearly weren’t but there was never a special group in the Communist party who was coming to special concerts. There were Plenary concerts but they were the same concerts as for everyone else. “Historically, in Russia, it’s the same for everyone. It’s a little bit different between classical concerts and opera. Ballet? That’s a different story altogether, but that’s the same everywhere – ballet goes to money. We suggest that the cost to see a classical concert is a misconception and that the hardest thing is stepping over the threshold into a “different” world. This gets to the crux of it. This is where things need to get laid to rest. And this is where he becomes animated. 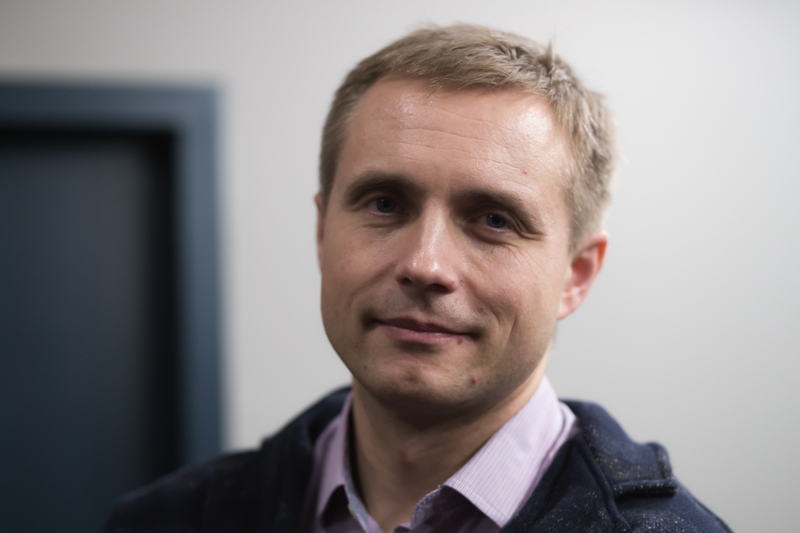 Vasily Petrenko: “I think it’s just a misunderstanding of the role. And you know, I think we have people from all circles of society attending. It’s not a closed club. It’s open to everyone. “Just give it a go! Just go! There’s no dress code – well, the only thing you have to have is clean clothes! “The difference is in Russia, historically, classical music is seen much more for educational purposes. So you’ll get parents bringing their kids to classical concerts – not just concerts for kids – but to normal concerts. The boundary line is six-years-old in Russia. Any child over six is taken to a normal evening concert, but under 6, well there is no limit for afternoon concerts. You do wonder for someone at the top of their game so to speak, whether it’s possible still to have any heroes, if there are any figures that inspire, is there anyone that inspires? Vasily Petrenko: “Hundreds! Thousands! I’m listening and watching to as many recordings and live concerts as possible and they always inspire me. “But for me as a professional – which is quite different to the majority of people, I think – when I’m coming to a concert I’m more…analysing than listening to it emotionally. To me, listening to any music is more of an analysis of how it’s created, the details the instrumentation, the harmonies, the melodies. “If it’s possible, it’s not just possible – it’s impossible for me to switch that off when I’m listening to music. “Maybe, just maybe there are brief moments when you get emotional, but most of the time it’s just your brain that’s shaped that way to analyse it all. We ask about listening to music emotionally rather than technically and whether he’d like to be able to do that more. Whether he thinks that listening to music on a technical level detracts something and in some way. He leans forward, very animated once again. “I would love to, yes! And sometimes, yes, I wish I could! “And sometimes there’s an incredibly emotional performance but it’s not in the right pitch and instead of being amongst the people who can forget about this technical fault well…instead of being able to enjoy it emotionally I’m thinking it should be a bit sharper or a bit flatter but… maybe it’s sad. I don’t know! “But really my true inspiration is the sounds of nature and the sounds of the city and the sounds around us, but not music. We wonder what was the last piece of music that moved him emotionally? Has there been anything at all recently? 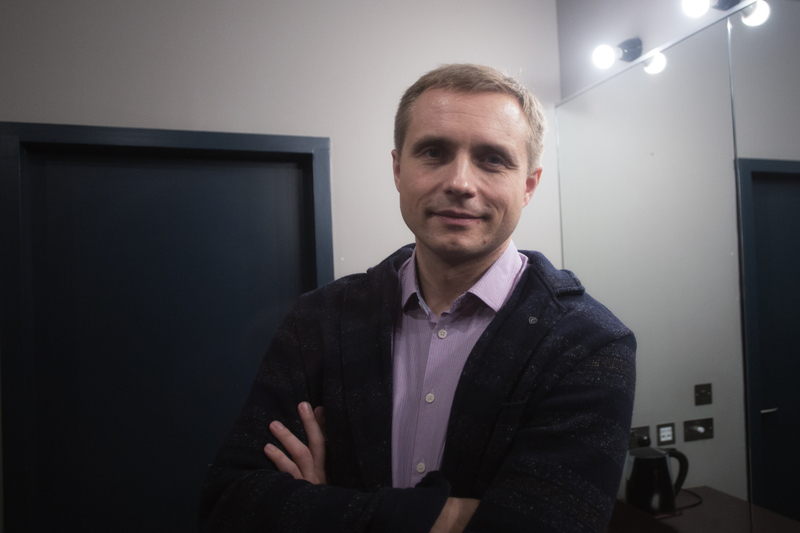 Vasily Petrenko: “You know the thing is, well, when you’re listening to your own concerts and when you’re doing your own performances, there is a lot, a lot of emotional involvement. For me at least, I always feel incredibly involved emotionally when I’m doing my own performance rather than listening to anything else. “For example, two nights ago we did Verdi’s Requiem and this is where you get really moved and towards the end you feel like you’re reborn. He smiles. We guess he knows what we are going to say. He may be the conductor of a world class orchestra and quite frankly, a musician to his core but at heart, we are all music fans. Maybe we have something in common. Music. What makes you marvel? Is there anything that’s jaw dropping that makes you think wow! Vasily Petrenko: “All the time. Every day. I mean we just did six hours of Falstaff and there’s incredible music and there’s Shakespeare so every time you think about something that was created many, many years ago, maybe hundreds of years ago, you think about the inspiration, you think about the writers and composers, and it’s incredible stuff. “And for yourself, as a conductor, what are you going to leave afterwards? We leave memories for people, maybe thirty, forty or even fifty years and after that very few people will remember. Very few. “And as a matter of fact, conductors from the mid-twentieth century, before Herbert von Karajan, how many are remembered? Very few, Very few. It all seems quite bleak. We suggest that as a conductor, he has the chance and the talent to create those moments that make the art something to remember forever. Petrenko sighs somewhat but tries to explain. We have to get personal. I try to turn things around. I tell him of the time, back in early 2011, when I took my then 24-year-old son to his first ever classical concert. At the Phil. Mahler’s 1st Symphony. The first of the Mahler cycle that Petrenko performed with the RLPO, and although my son had heard classical music on the radio and seen performances on television, nothing could have prepared him for what he saw. As we left the Phil that night, he turned to me and told me it was something he’d never forget. Surely that has to count for something? There’s a pause and we both fall into a reflective silence for a few seconds. Maybe he’s right. I decide to try to lighten the mood somewhat. I ask if there’s any new music that he’s heard or anything that’s particularly excited him recently. Is there anything? This perks the conversation up. The next answer to our question takes me so much by surprise I nearly fall off my chair. I ask outside of classical music, what other sort and what other types of music does he listen to? He is emphatic. One word. He pauses for a moment. I try to raise an eyebrow, Roger Moore-style. I don’t know whether it works but he goes on to clarify. Vasily Petrenko: “Apart from work, on purpose I’m not listening to anything. Anything at all. The problem is that music is constantly playing inside my head. “Imagine if you’re a rock group or a pop group? You record and make an album and you go on tour and you’re performing that same set of songs or a year or two years or so? “As a classical musician, you’re performing different music every single week. A different programme. Sometimes twice a week, totally different programmes. Once you’ve done this concert, then the music from this concert is still playing inside your head. And yet the next morning you have to start on something completely different, completely new. That’s quite a big challenge. “There’s maybe one or two days a year when I don’t listen to music at all, but I’m thinking about music all the time. Every day. All the time. “I’m talking to you and the music from Falstaff is still playing in my head! And there’s a problem sometimes when there’s not just one but two pieces of music playing in your head all the tme at the same time. If there’s anyone who can advise us on our next question, our final question of the interview, then there’s probably no one better than someone who’s steeped in music to their very core, someone who clearly lives and breathes music. It’s a problem that we often find ourselves wrestling with and one where we consistently struggle to find an answer – or at least the correct or most fitting answer. Maybe Vasily Petrenko can help us. So, Vasily, do you have a go-to-piece of music, something you can rely upon to never let you down, a piece of music when all else has failed you and your palate needs refreshing? Have you got one and what do you recommend? He pauses for a moment. Like the rest of the interview, all his answers have been well-considered and well thought out. He’s someone who doesn’t give off-the-cuff or standard off the shelf replies. It’s a measure of the seriousness of the man, how much he cares for and loves what he does that he’s thought through all of our, at times, naive questions and dealt with them very carefully and honestly. His final answer is a mixture of a personal story as well as something of a prescription. A way to move forward with music. He pauses a lot between his words. This is something that he wants to get across. Vasily Petrenko: “You go to the earliest written music. Gregorian chants. Before classical music as we know it. Or folk music. Not folk music as we know it now – not as genre – but music of the regions, Aboriginal music or incredible music around Mongolia. Weird instruments and something that’s incredibly different. He doesn’t do as such as wag a finger at me but stabs his finger in the air, as if to really emphasise his point and underline everything he’s telling us. “For me, outside of Oslo, I can in twenty minutes be in the middle of the forest and away from everything and in almost total silence. Almost total silence. Almost. He leans forward towards me and clasps his hands together. I nod. I’ve seen it on television. I have a vague idea. “Just outside of St Petersberg there’s the Finnish Gulf. It’s completely frozen and with a snowmobile you can travel five or maybe six kilometres into the ice.